A female cyclist, 44, was injured after she was knocked down by a truck near Mustafa Centre in Little India in the wee hours of Monday morning (Apr 8). Several Stompers alerted Stomp to a video that was posted online showing the incident and its aftermath. In the video, the woman is seen filtering into the lane the truck is in and cycling in front of it. She falls to the road after the truck hits her and is heard shouting for help. The truck driver reverses his vehicle and gets out to try to help the woman. In a clip of the aftermath, the woman is seen pointing and cursing at the driver. She curses at him, "F**k you!" before saying she was "trapped inside". She then makes a call to her boss and tells him that she was involved in an accident. She passes the phone to the truck driver and demands he speaks with her boss before shouting, "F**k you" at him again. 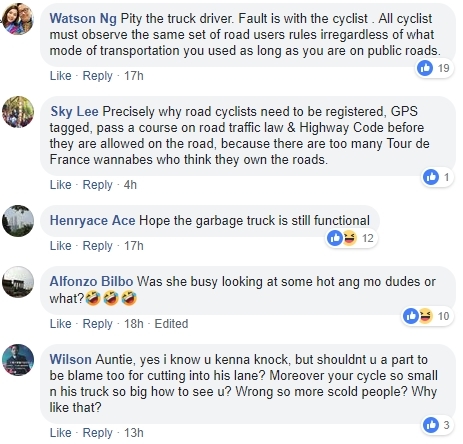 The video has since garnered over 24,000 views and many netizens believe the cyclist was at fault for cutting in front of the truck driver without considering his blind spots. In response to a Stomp media query, the police said they were alerted to the accident along Syed Alwi Road towards Jalan Besar at about 1.06am. The cyclist, a 44-year-old woman, was taken to Tan Tock Seng Hospital.